Now don't get me wrong, I'm pretty fascinated by royalty just like the rest of the world, but this whole thing is a bit out of control. Last night I was watching the news, well, half watching the news, like I always do. I have a hard time focusing on one thing, so I watch the news, and get ready for bed, and fold some laundry, and pack the baby's lunch, and eat a snack, and do my nails. Like all at the same time. 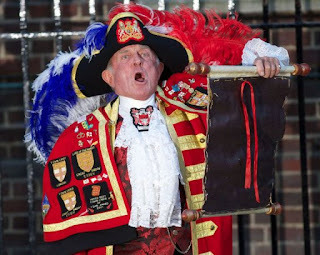 And I became convinced that this guy was announcing the duchess' labor progress. So I finally realized that he was simply announcing the baby's birth, but that is still entirely insane. How is everyone so excited about this baby, but nobody is mentioning anything about the crazy guy with two gigantic feathers coming out of his head, proclaiming that the baby arrived? In this 'digital age', is the feather dude really necessary? I'm not sure, but I am real glad that this guy wasn't actually announcing the progression of labor.